Navbar stands for navigation bar and you can always see it on the top portion of your Blogger blog. As the name indicates , it aids your movement from the front page to Login and to dashboard . Also users can flag and report any potential violation directly to Google through a button on Blogger navbar. There are two methods . One deals with a way to hide Blogger navbar and other with the removal . Open dashboard ,select the blog on which hack is to be implemented . 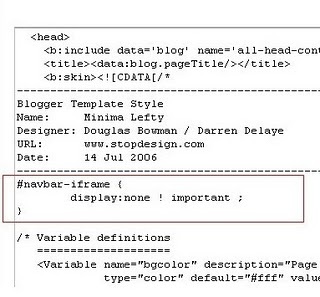 Move on to the Blogger templates‘ layout and select edit HTML . Place the following code just below this line and save the template . Though the navbar is completely CSS , hiding them has a little SEO value as you can avoid the encounter of search engine crawler with “login to Blogger” and other links on navbar (Got this idea from another blog). Update : Hiding navbar is not aganist Blogger TOS .